Jersey Shore amusements are attractions that are "shore" to please! From the rides in Seaside Heights and Atlantic City to Wildwood parks like Morey's Piers and Mariner's Landing, the Boardwalk's amusement parks are the place to be from spring until fall. 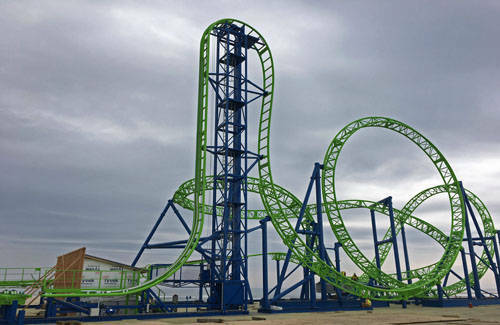 For a thrilling ride, try the Crazy Mouse roller coaster at the Steel Pier in Atlantic City, the SkyScraper at Morey's Piers in Wildwood or Tower of Fear at Funtown Pier in Seaside Park. Arcades are also a fun way to spend a few hours on the Boardwalk. Jilly's in Ocean City is open year-round with dozens of your favorite arcade games. New for Summer 2017 is the 200-foot-high Observation Wheel at the Steel Pier in Atlantic City, featuring climate-controlled gondolas and a panoramic view of the beach, the boardwalk and the city. You'll be able to see for miles up and down the coast of New Jersey. Please check our directory of Jersey Shore amusements for the perfect entertainment for your family.